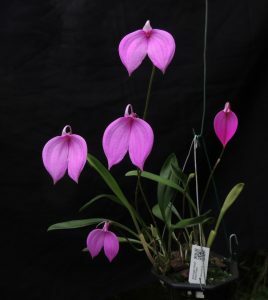 This extraordinary masdevallia species produces masses of large brightly coloured flowers in a range of colours including white, yellow, red and pink. 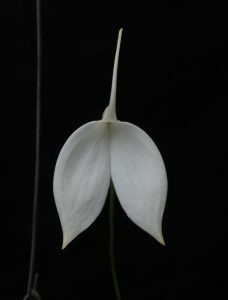 It comes from Colombia and Peru where it grows in cool wet forest up to 3000m altitude. 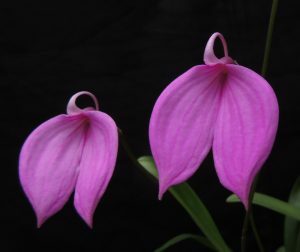 At the moment we have our dwarf pink form in full flower – dwarf for Masdevallia coccinea means that the flower spikes are up to 20cm long but the flowers are still large – and the alba variety which is a more normal size with 40cm flower stems. The long flower spikes hold the flowers well clear of the leaves for its humming bird pollinator. We grow all of our Masdevallia coccineas in baskets and find that they enjoy the moist conditions and excellent drainage alowing the thick roots to flourish.